How does your Realtor® compare? When it comes to honest real estate, I pride myself in making sure I treat people right. I am proud to say that with hard work comes recognition. 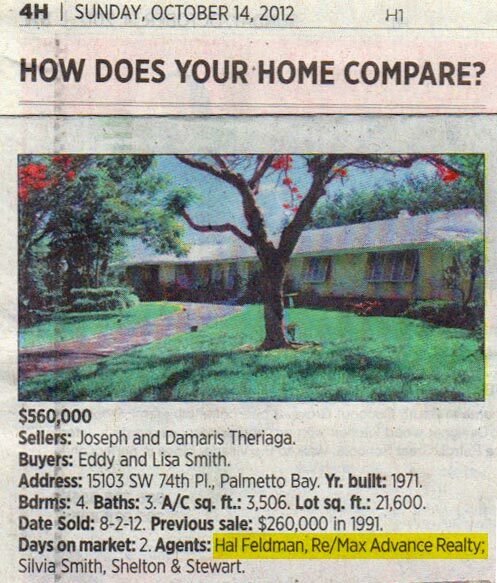 On October 14, 2012 I was recognized yet again in the Miami Herald's "How Does You Home Compare?" column. You will note that this home was sold in just TWO DAYS. Properly priced, the home immediately had multiple offers after one days of showings. A fair price was negotiated with the best offer and a closing occurred shortly thereafter. It would be my pleasure to work with you no matter what the price of your dream home. Contact me today!